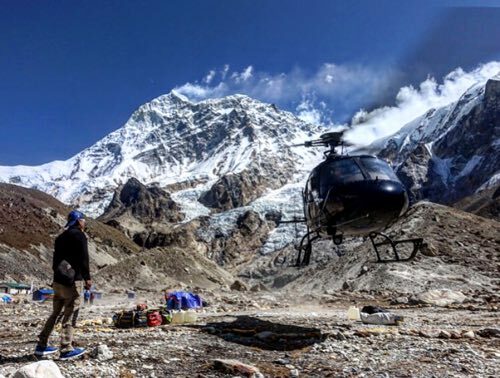 Flying to Makalu’s Advanced Base Camp set at an altitude of 5700m is surreal. It’s like being dropped off at a snow-capped summit of Kilimanajaro. Our heli pilot with oxygen bottle attached to his nostrils turns around and asks whether we know where the ABC actually is. We point down to a long tongue of dusty glacial moraine and shrug our shoulders. 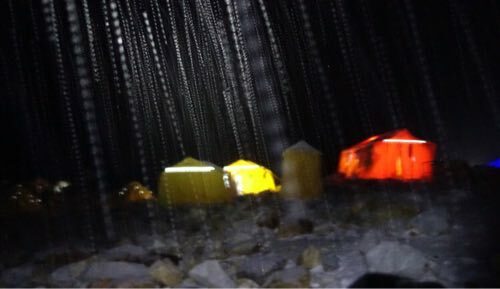 Soon we spot a few yellow tents tucked in by a superb glacial blue ice. There are no guided expeditions here; some 40 climbers; more than half climbing without oxygen; most have 5+ 8,000m summits. A far cry from crowded and hapless bazaar of the Everest’s BC. An adult climbing camp. 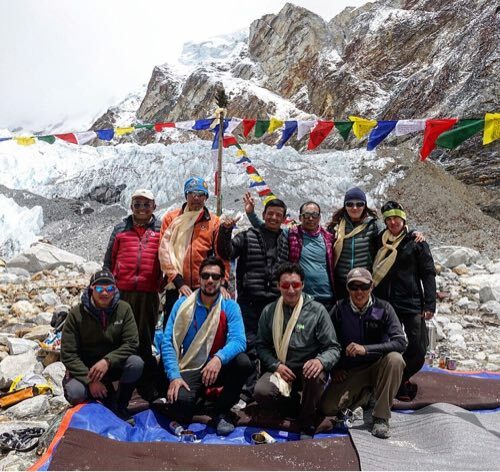 40 climbers, a handful of sherpas and a dog that trekked here for 6 days from Num with Zeb Revol, a superb female alpinist with whom we share a mess tent. 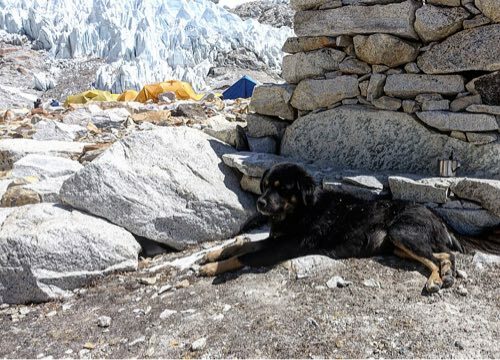 A handsome pup christened Trango has already climbed up to 6800m and completed his first round of acclimatisation. Somehow Trango has managed to make it through the crux pitch of 40 degree black ice. It failed to abseil down and had to come down in an alpinist’s backpack. Today the dog walked up again to C1. Trango is now looking solid for his first (?) 8,000m ascent. Same can’t be said about us. We are slowly descending into the base camp routine with its bright sunny mornings and thick snow in the afternoon. 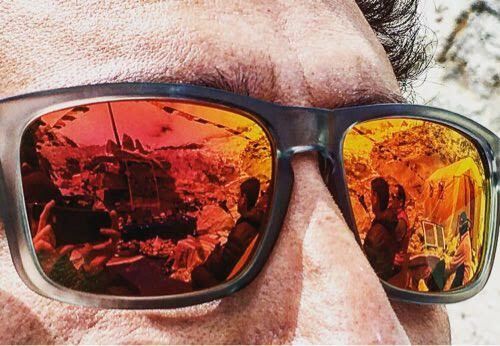 Inversions… Memories and flashbacks bring comfort. So does my -40 Inferno sleeping bag. My home away from home. Puja. First rotation tomorrow further up into the thinner air to sleep at C1 at 6400 and then at C2 at 6800. Followed by rest. Then another rotation with a night at Makalu La at 7400m. Follower by more rest at ABC and weather watching for a low-wind window. All of this seems very remote. For now, it’s about enjoying this work of being a ‘globuline’ factory and being with a small circle of people who share my passion for the sublime.